CRICKET: BERKSWELL returned to second place in the Birmingham Premier League following a comprehensive eight wicket win at neighbours Kenilworth Wardens on Saturday. Having won the toss, Wardens elected to bat first – a decision which soon backfired as opener Ben Rex had his off stump removed by Ryan Sidebottom with only the fourth ball of the match. A stabilising partnership of 76 in the next 19 overs between Harry Johnson and Basit Zaman calmed the home side’s nerves until Johnson (20) was stumped by Liam Gately off the left arm spin bowling of Nick James. The loss of Prerek Mankad (22) six overs later at 114, caught behind by Gately off another James delivery, brought Scott Stenning to the crease and he and Zaman added another 45 runs before Zaman (91) was bowled by James. 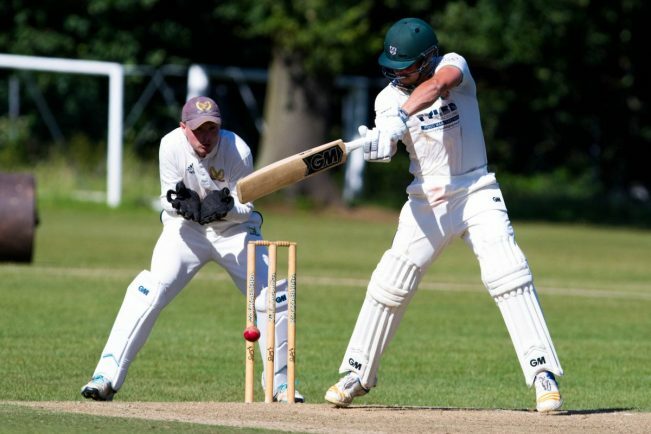 The departure of Zaman effectively ended the Wardens’ hopes of setting Berkswell a challenging total to chase as the next five wickets fell for only 27 runs with Alex Hepburn claiming three of the wickets to fall and Mohammed Ahmed two. A last wicket partnership of 28 runs between Nick Sale (21*) and Matt Hancock (7*) pushed the Wardens to a final score of 213/9 at the end of their allotted 55 overs. Nick James starred with the ball for Berkswell, returning with figures of 58/3, while Hepburn picked up three wickets for 39 runs. Berkswell’s start to their innings was almost a carbon copy of the home side’s as Mohammed Ahmed (0) was out to the last ball of the first over to leave the visitors looking nervously at the scoreboard. Chris Whittock (19) was then adjudged lbw in the eighth over with the total on 25. His dismissal brought Hepburn in to join Mark Best. However any worries the visitor’s may have had about reaching the target after the loss of two quick wickets were rapidly dispelled as the two batsmen proceeded to chase down the required runs. With boundaries coming regularly, and the bowlers looking more demoralised as the likelihood of taking wickets receded, both batsmen reached their half centuries. Having compiled an unbroken third wicket partnership of 189, victory was achieved in the 37th over with Best remaining unbeaten on 107, and Hepburn 86*. Berkswell return to Meeting House Lane on Saturday to face mid-table Walsall.